ABSTRACT: Many music scholars, particularly in jazz studies, have investigated performers’ real-time sonic interactions with one another. Very few, though, have asked how musicians interact with their audiences. The following article examines a performance that demands this kind of analysis: a 1976 concert in which saxophonist Roscoe Mitchell is confronted by an audibly hostile audience. Roscoe Mitchell was minding his own business. He and his bandmates in the Art Ensemble of Chicago were one month into a long tour of Europe, and as August 1976 came to a close, they were enjoying a rare weekend off (Janssens and de Craen 1983). The members of the Art Ensemble decided to spend their downtime in Willisau, Switzerland. A picturesque village near Lucerne, Willisau was home to one of the largest European jazz festivals of 1976, along with San Sebastián, Pescara, Montreux, Moers, Juan-les-Pins, and Châteauvallon (“Festivals” 1976, 4–6). The Art Ensemble performed at Châteauvallon on August 22, then headed to Switzerland, where they opened the Willisau festival on August 26 (Flicker et al. 1976, 10 and 13; Hardy 1976, 19). Their next concert—in Italy—was still a few days away, so the musicians stayed in Willisau to experience the rest of the festival. This would give Mitchell and his bandmates a chance to hear their AACM colleague Anthony Braxton, who was scheduled to perform in Willisau on August 28 (“Festivals” 1976, 6). As luck would have it, Braxton’s arrival in Willisau was greatly delayed. By late afternoon on the 28th, it was clear that Braxton would not make it to the festival on time. 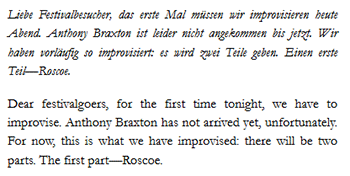 So Niklaus Troxler, the festival organizer, asked Roscoe Mitchell to take Braxton’s spot on the program and perform a solo saxophone concert (Martin 1977). (1) Mitchell agreed. “I ran to the hotel and got my alto,” he recalled: “I had an hour to warm it up” (Martin 1977). Mitchell tried to maximize what little preparation time he was granted. In fact, on the Willisau concert recording, he can be heard playing long tones backstage while he is being introduced by the emcee (Mitchell 1977). (2) Ordinarily he would have preferred to spend several hours warming up, not sixty minutes. But in another sense, he had been preparing for this moment for a decade. 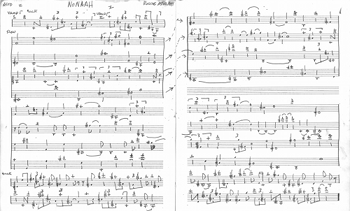 Mitchell decided to begin the Willisau performance with his composition “Nonaah.” The piece had been in his repertoire since 1972, when he composed a brief, étude-like score consisting of six angular phrases for alto saxophone (see Example 1, from Mitchell 1972). By 1973, Mitchell was including minute-long interpretations of “Nonaah” in his solo concerts (Mitchell 1974). He also wrote expanded versions of the piece for various small groups: a sextet score for the Art Ensemble of Chicago and guest pianist Muhal Richard Abrams (Art Ensemble of Chicago 1974); a duet version for piano and saxophone (Martin 1977); and a sketch for saxophone quartet (Mitchell 1976). 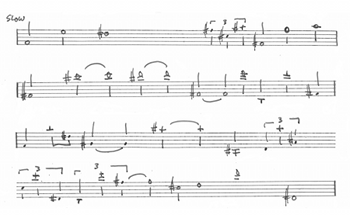 Mitchell completed the quartet sketch in 1976, shortly before the Willisau festival, and he used the Alto I part as the basis for his impromptu solo performance (see Example 2). The quartet is divided into three sections. The first section, labeled quick, consists of a single phrase that spans more than two octaves. As indicated by the vamp marking and the brackets above the staff, the opening phrase can be repeated any number of times (see Example 3). Next is the slow second section, where a series of short motives combine to form a longer theme (see Example 4). 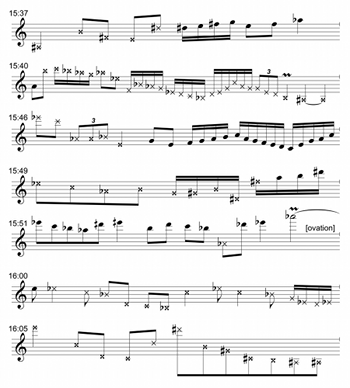 The third and final section of the quartet, also labeled quick, is based on the original 1972 solo score. The opening phrase returns midway through this section, giving the performer(s) an opportunity to “[pull] together” the first and third sections (Mitchell quoted in Martin 1977) and create an elegant ABA’ form (see Example 5). And indeed, that is what Mitchell intended to do at Willisau. But when he took the stage, he was faced with an unforeseen obstacle, and he had to adjust his plans to contend with a new emerging reality. In other words, he had to improvise. Of all the artists slated to appear in Willisau, Anthony Braxton was the most popular by a wide margin. In an audience poll taken at the festival, Braxton was voted “musician of the year” (Troxler 1976). He placed first and second, respectively, in the “miscellaneous instruments” and alto saxophone categories, and his latest Arista recording, Creative Orchestra Music 1976, was named the year’s best album (Braxton 1976; Troxler 1976). (3) Roscoe Mitchell’s Art Ensemble also earned accolades at Willisau, winning the “group of the year” category, with Anthony Braxton’s quartet finishing second (Troxler 1976). (4) But many in Willisau considered Braxton to be the biggest name on the festival roster. Some audience members, in fact, had traveled hundreds of kilometers to hear his set (Troxler 2015b). When the emcee announced that Braxton would not be performing, the festivalgoers were incensed, and they did not hide their displeasure (see Example 6). Once Mitchell strode onto the stage, half of the 1,000-member audience assailed him with catcalls and abuse (Mitchell 2015; Troxler 2015b). As the concert recording reveals, Mitchell is surprised, though not subdued, by the crowd’s reaction. Without hesitation, he addresses the microphone and starts to play the opening phrase of “Nonaah,” stuttering just a bit on the initial E6. (6) At the end of the phrase, he holds the last note for a little more than a second. Then an audience member near the stage shouts at Mitchell—loudly enough to be heard by everyone in the festival hall (Troxler 2015b). Mitchell responds by repeating the opening phrase, this time holding the final G 4 for two full seconds, a preemptive strike against another audience outburst (see Example 7). The sustained G 4 serves two purposes: it quiets the hostile audience members, at least temporarily, and it opens up a unique interpretive strategy—a way to navigate “Nonaah” as well as “the environment the piece was to take place in” (Mitchell quoted in Martin 1977). Mitchell came to the festival hall to play a solo concert, but he soon found himself in an unexpected “battle” with Anthony Braxton’s supporters. Instead of confronting his antagonists directly, or attempting to ignore them, Mitchell resolved “to make the noise and whatever was going on with the audience part of the piece” (Martin 1977). To accomplish this, he would have to transform the sounds of the crowd’s reaction into material for a musical interaction. Mitchell’s strategy for interacting with the Willisau audience is based on two elemental techniques: repetition and variation. He repeats the opening phrase again and again, showing his determination to keep playing in face of the crowd’s animosity. As he later explained, “The music couldn’t move [until] they respected me, until they realized that I wasn’t going anywhere, and if someone was going it would have . . . to be them” (Martin 1977). At the same time, he introduces subtle variations to the opening phrase, demonstrating that he is indeed engaging with the festivalgoers—but on his terms, not theirs. If the audience members want to get the most out of Mitchell’s performance, they need to stop protesting and start listening. The first variations of the phrase center on the final note, G 4. Mitchell initiates this process immediately, during the second statement of the phrase, when he stretches the concluding G 4 to twice its original duration, filling up the silent space that a heckler might be tempted to exploit. With each statement of the phrase, the final G 4 grows longer and longer. By the fifth statement, Mitchell is holding G 4 for more than four seconds, long enough that the note almost sounds like a separate phrase in its own right (see Example 8). At this point, Mitchell’s extension of the phrase ending is fast approaching a limit. If he attempts to sustain the next G 4 for much more than four seconds, it could consume most of his air capacity and affect the way he interprets the rest of the phrase. So he stabilizes the phrase ending, holding each subsequent G 4 for approximately four seconds. 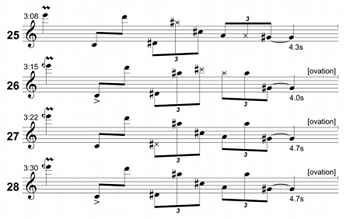 With this rhythmic transformation complete, Mitchell can turn his attention to E6, the phrase’s first note. He tunes this note differently on each repetition of the phrase, sometimes playing it as much as a half step flat and at other times bending the pitch to create two or three distinct microtones (see Example 9). Mitchell’s interpretation of the phrase invites the audience members to listen closely to each E6. It was already one of the most salient notes in the phrase, due to its high pitch, its placement near the top of the alto saxophone’s normal range, and its role as the note that announces each new phrase statement. Now Mitchell is giving every E6 additional emphasis through his use of expressive intonation. In contrast, the rest of the phrase remains much the same, further highlighting the note that varies from one repetition to another. However, these slight tuning variations do not significantly change how the phrase sounds. Neither does the next variation: a series of dynamic shifts applied to the final G 4, beginning in the eighth statement. The festivalgoers must be anxious for the next major event in the performance, but Mitchell makes them wait, as he develops the phrase at an astonishingly deliberate pace (see Example 10). A minute and a half into the performance, the rate of development suddenly accelerates. In the fifteenth statement, Mitchell introduces two new variations, one after another. When he reaches the triplets partway through the phrase, he adopts a much rougher timbre, partially obscuring the pitches he is playing. At the phrase’s end, he lands on G 4, a semitone below the usual pitch, then gradually bends the note upward so the phrase can conclude on G 4. These variations catch the festivalgoers’ attention, and a few start to applaud. Mitchell picks up on their reaction and decides to repeat these variations in the next phrase statement. This time, the crowd’s response is even bigger. As Mitchell sustains the final note, a number of audience members clap, whistle, and cheer. When he pauses to breathe, the ovation spills over into the space between phrases—the same interval where, less than two minutes earlier, a heckler yelled at Mitchell. Now the saxophonist is discovering how to win the audience over (see Example 11). The audience members seem most responsive to two aspects of Mitchell’s playing. One is his use of complex timbres: as the performance unfolds, the loudest ovations tend to follow phrase repetitions where Mitchell employs a rougher tone. The festivalgoers also respond favorably to Mitchell’s persistence. After every few statements of the phrase, they offer another round of applause, as if to salute the saxophonist for continuing to repeat and develop the opening phrase in ways that defy all expectations. Mitchell’s commitment to repetition is epitomized by the drawn-out G 4 that ends each phrase. He holds these notes as long as he can, until just before his breath runs out, transforming each phrase repetition from a compositional choice to a demanding physical feat. 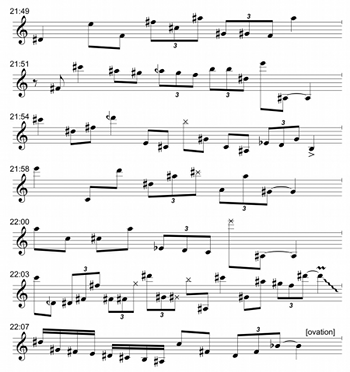 In the twenty-fifth statement, he plays the triplets with a rough timbre, then slides into the final G 4 and sustains it for 4.3 seconds, matching the longest duration heard so far. The audience erupts into an ovation that lasts for twenty seconds, through three more repetitions of the phrase. 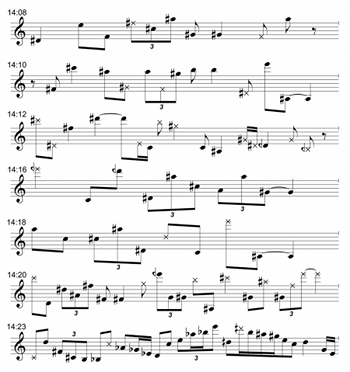 By the twenty-seventh and twenty-eighth statements, Mitchell’s G 4 has stretched to almost five seconds in length, and the crowd responds in kind, falling silent only when the saxophonist rests (see Example 12). After this interaction with the audience, Mitchell stabilizes the phrase once again. During the next minute of the performance, no new variations emerge, but the festivalgoers keep encouraging Mitchell, whistling and cheering at the end of every other phrase. Meanwhile, the saxophonist is pacing himself and preparing the audience for the next round of development. This process begins in the thirty-fifth phrase statement, when he starts changing the pitches in the first group of triplets. Mitchell also reintroduces the complex timbres he employed earlier, this time focusing on the midrange A4s and A5s just before the G 4 at the phrase’s end. Finally, in the forty-fourth statement, Mitchell is ready to apply his timbral transformations to the longest note of the phrase. He plays through the phrase using an incredibly rough tone—so coarse, in fact, that when he arrives at G 4, the note breaks up into five distinct attacks. The festivalgoers, already on alert for changes to the final G 4, respond with another ovation, the loudest one yet (see Example 13). Some five minutes into “Nonaah,” Mitchell’s strategy for interacting with the audience has paid off. He has established a strong rapport with the festivalgoers, who offer immediate, audible feedback whenever he plays something they like. Mitchell is also feeling more comfortable with his saxophone, after having to hurry through his pre-concert warm-up. At this point in the performance, Mitchell later recalled, “my alto had just given in to me. . . . I started to open it up soundwise by putting in smears and different sounds” (Martin 1977). Now that his saxophone is cooperating, Mitchell can push the phrase to its parametric limits. With each repetition, another note is choked, smeared, vibrated, growled, or otherwise subjected to extremes of timbre and articulation (see Example 14). Mitchell’s timbral experiments culminate in the sixtieth statement of the phrase. Every note is played with a variant of the complex tone color that he has been developing for almost seven minutes. And then, in the next statement, Mitchell suddenly returns to the relatively clean tone that he used at the beginning of the performance. 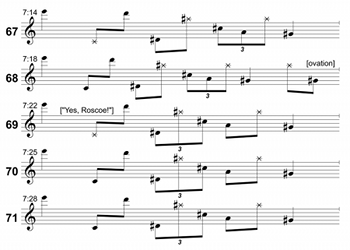 By the sixty-second statement, the phrase’s original timbral profile has been restored. 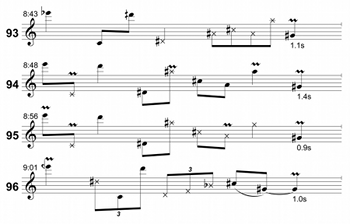 Mitchell pauses for an instant before playing the last note, then holds G 4 for just over a second, as in the very first statement of the opening phrase (see Example 15). Now Mitchell has a choice to make. Except for a few details—notably the vibrato applied to the final G 4—the sixty-second statement sounds much like the first. To the festival audience, it must seem as if Mitchell has returned to the place where “Nonaah” began, seven minutes earlier. This moment of arrival has major formal implications. At this point, Mitchell could end the first section of the piece and proceed directly into the second section. He could even bring “Nonaah” to a close and start playing the next piece on his set list, Joseph Jarman’s composition “Erika” (Mitchell 1977). (7) Instead, he decides to keep developing the opening phrase. The new series of variations begins right away, in the sixty-third statement. Here, Mitchell holds G 4 for less than a second, a shorter duration than any other G 4 heard so far. This allows him to expand the phrase in other ways, and he adds a brief tag ending, repeating the last three notes. He uses a similar tag to introduce the next statement of the phrase, and the festivalgoers applaud as he leads them into unexplored territory. Only seconds after an arrival that could have ended the piece, Mitchell is venturing deeper into the sound-world of “Nonaah” (see Example 16). As he observed after the concert, the musical ideas on which the composition is based “all come from the same world or atmosphere. The thing about ‘Nonaah’ is that once you put yourself in that atmosphere you can ride on forever. The world has the properties of very large skips [,] and it has notes that have accidental qualities that are kept” (Martin 1977). In other words, “Nonaah” offers Mitchell endless possibilities for variation, from the phrases that make up the composition to the new ideas that emerge spontaneously during performance. Mitchell’s description of “accidental qualities that are kept” could refer to the changes introduced in the sixty-third statement: a shorter G 4 and the added notes of the spontaneous tag ending. In each of the phrases that follow, Mitchell keeps paring down the duration of the final G 4, until it becomes as clipped and detached as all the other notes. He also adds and subtracts notes from the phrase, one or two at a time, creating expanded or contracted versions of the phrase that soon return to the original nine-note configuration (see Example 17). 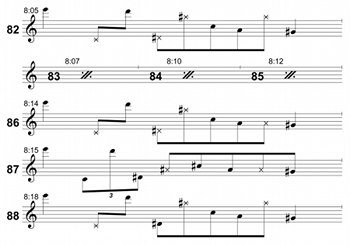 This alternate approach to variation transforms the phrase’s sound. Earlier in the performance, the “accidental qualities that [Mitchell] kept” became the objects of further variation, and the music developed in a linear way, with each version of the phrase building on those that preceded it. Now, Mitchell’s variations are based on addition and subtraction. Each time he makes a change to the phrase, he immediately strikes it and starts the process over again. Additionally, because the concluding G s are much shorter in duration, Mitchell can play the entire phrase in three seconds or less. By the eighty-second statement, he is cycling through the phrase at a rapid rate. The opening phrase has become an unrelenting loop (see Example 18). Seven statements later, Mitchell finally moves away from the repeating loop. He gradually works his way back to the original interpretation of the phrase, eliminating all added notes and once again sustaining each G 4 for about a second. Mitchell also starts drawing out the low C4s, D 4s, and midrange A4s and A5s, creating a sense of steady deceleration. He launches into the phrase for the ninety-sixth time, then breaks it off midway through, closing the statement with a B -major arpeggio and a smeared descent to G 4. At last, the first section of “Nonaah” has come to an end, after nine minutes and ninety-six statements of the opening phrase (see Example 19). Mitchell rests for a few seconds, letting the last G 4 echo throughout the festival hall. When he returns, the first sound to emerge from his saxophone is not a high E6 but a quiet, midrange long tone. This is the second section of “Nonaah,” which contrasts with the first section in virtually every way. The opening phrase and the second section’s theme do share one common element—“very large skips” between notes, as Mitchell put it—but everything else has changed (Mitchell quoted in Martin 1977). The complex timbres of the first section have given way to cleaner tones, the pace is slower, and the dynamics are much softer (see Example 20). At Mitchell’s current dynamic level, he would be no match for the unruly festivalgoers who interrupted the beginning of the concert. Now, however, the audience members are fully invested in the performance, and they take care not to overshadow Mitchell’s playing. During the next two minutes, they listen expectantly as Mitchell interprets the second section’s theme. Next, Mitchell improvises on the theme for two-plus minutes, using shorter note values but the same subdued dynamics. In his improvisation, Mitchell never strays far from the theme. He often focuses on one of the theme’s seven motives, reordering its notes or distilling the motive into a single gesture. At other times, he treats the theme more strictly, playing several motives in sequence with few alterations (see Example 21). Through all of this, the audience maintains a respectful silence. In their earlier sonic interactions, Mitchell and the festivalgoers resolved their initial conflict and showed that they were indeed listening to each other. With this established, they can adopt another mode of engagement, where the musician performs and the audience listens, actively yet silently. Almost fourteen minutes into the performance, Mitchell concludes his improvisation on the second-section theme and introduces the third section of “Nonaah.” Like the first section of the piece, the new texture is loud and dense, with a fast-moving theme. And as in the opening, Mitchell builds the third section on repetition and variation. He begins by playing the composed theme, then a brief improvised interlude. Longer interludes follow the second and third statements of the theme (see Example 22). Mitchell starts to play the theme again, but during the last phrase, he shifts into an open improvisation, never quite reaching the end of the theme. For the first time in the performance, Mitchell has moved away from his notated composition to engage in free improvisation. In this improvisation, Mitchell finally unleashes the development strategies and saxophone techniques that, earlier in the performance, he had kept under tight control. He takes repetition and variation to a new level: at one point, he plays the same low B3 fifteen times in a row, using a growling, buzzing timbre that grows rougher with each repetition. Before and after this episode, he ventures into the altissimo register, a range he avoided during the first fourteen minutes of the piece. He also experiments with an extraordinarily wide vibrato and a gleaming saxophone tone that seems to “shine” brighter than the spotlight at center stage (Lewis 1999, 67). Mitchell’s improvisation is stunning to hear, so much so that the audience only dares to interject when he pauses for a few beats to catch his breath (see Example 23). After the last of these sonic exchanges with the audience, some twenty minutes into “Nonaah,” Mitchell returns with a new kind of melody: rapid runs where he plays more than a dozen notes in the span of one or two seconds. He explores this texture for a minute and a half, bringing his improvisation to a state of peak intensity. And then he finds his way back to the third section’s theme. Mitchell plays the theme just once, and caps it off with one last low-register run and another B -major arpeggio, the same motive he used to signal the end of the first section. With this gesture, Mitchell brings “Nonaah” to a close, and the festivalgoers respond with an extended ovation, acknowledging the saxophonist for a performance that went well beyond what they—and he—expected (see Example 24). A recording of Roscoe Mitchell’s performance was released one year after the Willisau festival, on the double album Nonaah (Mitchell 1977). The album also included another version of “Nonaah”—the arrangement for saxophone quartet—but the 1976 solo performance would become the most celebrated interpretation of the piece. Mitchell himself has given several lectures about “Nonaah” (Mitchell 2010; Mitchell 2014), and there are a number of written accounts of the festival performance, from contemporaneous reviews (Anders 1976, 18; Hardy 1976, 20) to scholarly treatments by Dana Reason (2004, 80–81) and Jane Reynolds (1993, 66–72). Reason discusses the concert’s contentious opening (2004, 80–81), while Reynolds compares the Willisau performance to Mitchell’s arrangements of “Nonaah” for various chamber ensembles (1993, 59–107). But the present analysis is the first to devote sustained attention to the performer-audience interactions that made the Willisau concert so special. The most extensive treatment of performer-audience interaction may be found in Christopher Washburne’s Sounding Salsa (2008). Here, Washburne develops Berliner’s notion of the performer-audience “communication loop,” shifting the scene from urban jazz venues to East Coast nightclubs where salsa bands play for dancers (2008, 63 and 66). Writing from the perspective of a veteran salsero, Washburne examines performer-audience interaction from every angle, analyzing the musical structures that facilitate salsa dancing, the verbal dialogues between bandleaders and dancers, and the social, sonic, and spatial environments in which salsa performances occur (2008, 55–76). Ethnography is at the core of Washburne’s research: he spent years playing trombone in top-notch Latin bands, and he interviewed numerous figures on the New York salsa scene, from prominent bandleaders to everyday working musicians. Anders, Johannes. 1976. “Jazz-Festival Willisau.” Jazz Podium 25 (10): 18–19. Ashe, Bertram D. 1999. “On the Jazz Musician’s Love/Hate Relationship with the Audience.” In Signifyin(g), Sanctifyin’, & Slam Dunking: A Reader in African American Expressive Culture, edited by Gena Dagel Caponi, 277–89. University of Massachusetts Press. Born, Georgina. Forthcoming 2017. “After Relational Aesthetics: Improvised Musics, the Social, and (Re)Theorising the Aesthetic.” In Improvisation and Social Aesthetics, edited by Georgina Born, Eric Lewis, and Will Straw. Duke University Press. Cannone, Clément, and Nicolas Garnier. 2011. 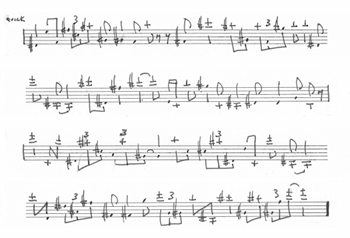 “A Model for Collective Free Improvisation.” In Proceedings of the Third International Conference on Mathematics and Computation in Music, edited by Carlos Agon, Moreno Andreatta, Gérard Assayag, Emmanuel Amiot, Jean Bresson, and John Mandereau, 29–41. Springer-Verlag. Davis, Francis. 1983. “Roscoe Mitchell: The Art Ensemble’s Sage Saxist Brings Order out of Improvisatory Chaos.” Musician 62: 26, 28, 30, 32, 34. “Festivals: Et ce n’est qu’un début . . . ” 1976. Jazz Magazine 244: 4–6. Flicker, Chris, Alain-René Hardy, Serge Loupien, and Francis Marmande. 1976. “Chateauvallon: La part du feu.” Jazz Magazine 248: 6–15. Givan, Benjamin. 2016. 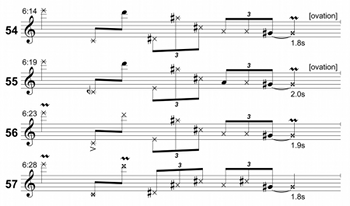 “Rethinking Interaction in Jazz Improvisation.” Music Theory Online 22.3. Hardy, Alain-René. 1976. “Willisau: Un festival heureux.” Jazz Magazine 248: 18–21, 37. Janssens, Eddy, and Hugo de Craen. 1983. Art Ensemble of Chicago Discography: Unit & Members. New Think. Jarman, Joseph. 2006. Scrapbook of concert flyers, photographs, and press clippings. Collection of Joseph Jarman. Lewis, George E. 1999. “Purposive Patterning: Jeff Donaldson, Muhal Richard Abrams, and the Multidominance of Consciousness.” Lenox Avenue 5: 63–69. Lewis, George E. 2000. Liner notes for Fred Anderson Quartet, Volume Two, Asian Improv AIR 0054, compact disc. —————. 2000. Liner notes for Fred Anderson Quartet, Volume Two, Asian Improv AIR 0054, compact disc. Lewis, George E. 2008. A Power Stronger Than Itself: The AACM and American Experimental Music. University of Chicago Press. —————. 2008. A Power Stronger Than Itself: The AACM and American Experimental Music. University of Chicago Press. Martin, Terry. 1977. Liner notes for Roscoe Mitchell, Nonaah, Nessa N-9/10, 33⅓ rpm. Martin, Terry. 1993. Liner notes for Art Ensemble [of Chicago], 1967/68, Nessa NCD-2500, compact disc. —————. 1993. Liner notes for Art Ensemble [of Chicago], 1967/68, Nessa NCD-2500, compact disc. Mitchell, Roscoe. 1972. “Nonaah.” Autograph score for alto saxophone solo. Collection of Roscoe Mitchell. Mitchell, Roscoe. 1976. “Nonaah.” Autograph sketch for alto saxophone quartet. Collection of Roscoe Mitchell. —————. 1976. “Nonaah.” Autograph sketch for alto saxophone quartet. Collection of Roscoe Mitchell. Mitchell, Roscoe. 2010. “‘Nonaah’ and the Composition/Improvisation Connection.” Lecture presented at the University of Chicago, November 18. —————. 2010. “‘Nonaah’ and the Composition/Improvisation Connection.” Lecture presented at the University of Chicago, November 18. Mitchell, Roscoe. 2014. “‘Nonaah’: From Solo to Full Orchestra.” Lecture presented at Washington University in St. Louis, December 5. —————. 2014. “‘Nonaah’: From Solo to Full Orchestra.” Lecture presented at Washington University in St. Louis, December 5. Mitchell, Roscoe. 2015. Telephone interview by author. Oakland, Calif., November 2. —————. 2015. Telephone interview by author. Oakland, Calif., November 2. Monson, Ingrid T. 1996. Saying Something: Jazz Improvisation and Interaction. University of Chicago Press. Reason, Dana. 2004. “‘Navigable Structures and Transforming Mirrors’: Improvisation and Interactivity.” In The Other Side of Nowhere: Jazz, Improvisation, and Communities in Dialogue, edited by Daniel Fischlin and Ajay Heble, 71–83. Wesleyan University Press. Reynolds, Jane Martha. 1993. “Improvisation Analysis of Selected Works of Albert Ayler, Roscoe Mitchell, and Cecil Taylor.” PhD diss., University of Wisconsin-Madison. Steinbeck, Paul. 2017. Message to Our Folks: The Art Ensemble of Chicago. University of Chicago Press. Troxler, Niklaus. 2015a. Email message to author. October 27. —————. 2015a. Email message to author. October 27. Troxler, Niklaus. 2015b. Email message to author. October 28. —————. 2015b. Email message to author. October 28. Washburne, Christopher. 2008. Sounding Salsa: Performing Latin Music in New York City. Temple University Press. Art Ensemble [of Chicago]. 1993. 1967/68. Nessa NCD-2500. Compact disc. Art Ensemble of Chicago. 1974. Fanfare for the Warriors. Atlantic SD 1651. 33⅓ rpm. Braxton, Anthony. 1976. Creative Orchestra Music 1976. Arista AL 4080. 33⅓ rpm. Braxton, Anthony, and Muhal Richard Abrams. 1976. Duets 1976. Arista AL 4101. 33⅓ rpm. Mitchell, Roscoe. 1974. The Roscoe Mitchell Solo Saxophone Concerts. Sackville 2006. 33⅓ rpm. Mitchell, Roscoe. 1977. Nonaah. Nessa N-9/10. 33⅓ rpm. —————. 1977. Nonaah. Nessa N-9/10. 33⅓ rpm. * Thanks are due to Roscoe Mitchell for his insights into the composition and performance of “Nonaah”; to Brad Short, the head librarian at Washington University’s Department of Music, for acquiring Mr. Mitchell’s scores and sketches; and to Jan Hartmann, Daphne Leong, George E. Lewis, and Niklaus Troxler, for their contributions to this article. 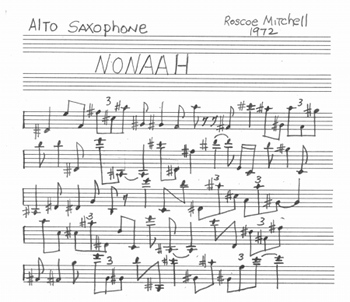 Thanks are due to Roscoe Mitchell for his insights into the composition and performance of “Nonaah”; to Brad Short, the head librarian at Washington University’s Department of Music, for acquiring Mr. Mitchell’s scores and sketches; and to Jan Hartmann, Daphne Leong, George E. Lewis, and Niklaus Troxler, for their contributions to this article. 1. Following Mitchell’s solo concert, the August 28 program concluded with another spontaneously arranged set performed by an ensemble that included Albert Mangelsdorff, Evan Parker, and Alexander von Schlippenbach (Troxler 2015a). 2. Niklaus Troxler himself served as the festival’s emcee (Troxler 2015b). 3. In the same “album of the year” category, Braxton’s Duets 1976 album placed third, giving him two LPs in the top three (Braxton and Abrams 1976; Troxler 1976). 4. The other members of Braxton’s quartet circa August 1976 were bassist Dave Holland, drummer Barry Altschul, and trombonist George E. Lewis, who had recently replaced trumpeter Kenny Wheeler. 6. Letter names refer to notes as written for the alto sax. 7. Joseph Jarman composed “Erika” in 1966, and the piece entered the Art Ensemble’s repertoire in 1967, two years before Jarman formally joined the group (Art Ensemble [of Chicago] 1993; Jarman 2006). For an analysis of the Art Ensemble’s 1969 recording of “Erika,” see Steinbeck 2017, 108–24. 8. A possible approach to the study of performer-audience interaction can be found in Dean and Bailes 2010, which uses computational analysis to theorize how improvisers can use acoustic intensity to communicate with one another and with their listeners. 9. The notion of improvisation as a co-creative process is developed further in an essay by Georgina Born (Forthcoming 2017). Following Mitchell’s solo concert, the August 28 program concluded with another spontaneously arranged set performed by an ensemble that included Albert Mangelsdorff, Evan Parker, and Alexander von Schlippenbach (Troxler 2015a). Niklaus Troxler himself served as the festival’s emcee (Troxler 2015b). In the same “album of the year” category, Braxton’s Duets 1976 album placed third, giving him two LPs in the top three (Braxton and Abrams 1976; Troxler 1976). The other members of Braxton’s quartet circa August 1976 were bassist Dave Holland, drummer Barry Altschul, and trombonist George E. Lewis, who had recently replaced trumpeter Kenny Wheeler. Letter names refer to notes as written for the alto sax. Joseph Jarman composed “Erika” in 1966, and the piece entered the Art Ensemble’s repertoire in 1967, two years before Jarman formally joined the group (Art Ensemble [of Chicago] 1993; Jarman 2006). For an analysis of the Art Ensemble’s 1969 recording of “Erika,” see Steinbeck 2017, 108–24. A possible approach to the study of performer-audience interaction can be found in Dean and Bailes 2010, which uses computational analysis to theorize how improvisers can use acoustic intensity to communicate with one another and with their listeners. The notion of improvisation as a co-creative process is developed further in an essay by Georgina Born (Forthcoming 2017).